The following is comprehensive Info on Las Olas Beach Club Resort, Satellite Beach Florida Oceanfront Condo Rentals and Time Share Exchanging. This Resort is affiliated with Resort Condominiums International (RCI) Timeshare Exchange Company and carrys their high "Gold Crown" rating. They rent beach front Time Share Vacation Condos by the week and for as little as 3 days within a Sat to Sat check in-out period. You do NOT have to be a timeshare owner to take advantage of these very affordable vacation timeshare condo rentals! Las Olas Resort is a Florida beach front rentals resort and has a summary listing on our Oceanfront Cocoa Beach - Satellite Beach Florida Rentals page along with several other beach front Time Share resorts. Satellite Beach is about 10 minutes south of Cocoa Beach Florida and about 15 minutes south of Cocoa Beach Port and great restaurants. Las Olas - Satellite Beach Resort Amenities, Pictures, and Rental Details are below. 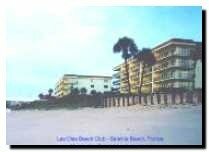 Las Olas Beach Club - Satellite Beach - 1215-25 Route A1A, Satellite Beach, Florida. 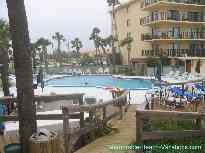 Very friendly family run Resort Condominiums International Time share Resort in Satellite Beach, Florida. Beach front resort rated "Gold Crown" by RCI. Our favorite place to vacation in Florida! The heated Swimming Pool and Outdoor Jacuzzi are between the two Condo buildings. Resort has several optional social and other fun activities during the week - or do your own thing - there's a lot to do and see in the Satellite Beach area!. Two 20 unit buildings. All Ocean-front 2-bedroom, 2-bath Condo units that sleep up to 6. (8 for additional fee.) Parking Garage is on first floor under the Condo Units in each building. All spacious (1400+ sq. ft.) Condos have full kitchen and washer and dryer in the unit. Can walk on the sand beach for miles in either direction. All Las Olas - Satellite Beach Condos have huge balconies overlooking the ocean - many also have a oceanfront balcony off of the master bedroom. Many units now have new furniture and carpeting due to replacements after the 2004 hurricanes. Rental Info & Rates Info are below. Rentals by the week and also from 3 days and up within a Saturday to Saturday week check-in are available. The current rates for a spacious 1,400+ square foot 2-bedroom, 2-bath beach front Las Olas Resort Condo can be seen on the Las Olas Rental Rate page below, with varying 7-day rental discounts depending on if it is high or medium demand season. (There is no "low" season at Eastern Florida Vacation beaches these days - people vacation there all seasons.) This link goes to Las Olas Rental Rate Info showing very reasonable rates + a Rental Date Availability Request form on the same page. You will usually need to plan ahead several months to get a rental at a peak time such as in March or April at a top rated Florida beach front rental resort like Las Olas - unless you happen to luck out on a last minute cancellation. It is worth the advance planning -- Las Olas is a Great Florida beach front rentals vacation destination. See details for Las Olas Rentals on this Las Olas Rental Rates and Request Rental Date Availability Form page - 3-day & up rental info and Rates available. Share your own Florida Vacation Beach Rental, Exchange, or Owner User Comments here. You Might be a Winner in the Contest! Some Migrating Whales were seen right in front of the Las Olas - Satellite Beach Resort in February, 2005. There are also some friendly Mantees which can be seen nearby in the Indian river and on a fun Kayak Tour which my Wife and I have been on and thoroughly enjoyed. They come up right next to your Kayak and sometimes "bump" it as if trying to get your attention. Here is a short "Manatee Encounter" Video. We own weeks 23 and 24 at Las Olas - Satellite Beach which usually fall in late May and early June. We purchased here in 1981 when the resort was being constructed. Weeks 23 and 24 are just after our kids got out of school in Nebraska, but before the crowds start to arrive - and at the time of year that the giant sea turtles come up on beach at night and lay eggs. (See more Info on giant sea turtles and link on our Why Florida Beaches page.) This Link goes to the RCI Las Olas Resort Info and Pictures page. Ten minutes south of Cocoa Beach, Florida on A1A. About 35 minutes south of Cape Kennedy Space Center and about 80 minutes from Orlando attractions. Eight miles northeast of less conjested Melbourne International Airport (as compared to busy Orlando International.) See more on this handy nearby Airport on our Cocoa + Satellite Beaches Tips page. Tip For fastest route to Orlando from Satellite Beach, Use #404 Pineda Causeway west over to Wickham Road connector route to I-95 - then up to the #528 Bee Line to Orlando. Tip Don't miss the Giant Sea Turtle Information talk on Sunday after your Saturday afternoon check-in. ALSO - don't miss the Las Olas Pot Luck Dinner/Social on Thursday evening! The Resort grills free hamburgers and hotdogs + supplies beverages and everyone brings their favorite dish for all to share! Great food and conversation with your fellow travelers - often from all over the world - sometimes even a few songs! Satellite Beach travel discount or rental web sites which you have discovered that are not mentioned here. Send to us on our Your Top Picks & Comments Page. Thanks! Favorite Satellite Beach and Cocoa Beach area Florida Beach Front Rentals + area attractions and places of interest you found interesting or memorable. Comments on great Florida vacation Beach area Time Share Resort weeks (preferrably beach front) you may own, have exchanged to, or any favorite Cocoa / Satellite Beach rentals. Send your Florida beach front rentals and other east coast Florida Favorites to us on our Top Picks & Comments Page Thanks! Florida / Virginia Beach Time Shares Guide (+ All Time Shares) - WHY Timeshares? Do they REALLY save you Vacation Dollars? To Ocean Landings Resort - Cocoa Beach Rental Condos special Info and pictures page - More detailed Info on II Ocean Landings Resort & Racquet Club at Cocoa Beach, Florida.